Pigs in blankets are great, they make a perfect accompaniment to your turkey on Christmas day, they are great as a starter and make an excellent festive finger food. I understand that in North America pigs in blankets are little Vienna sausages in pastry not dissimilar to a sausage roll, well these aren’t them. 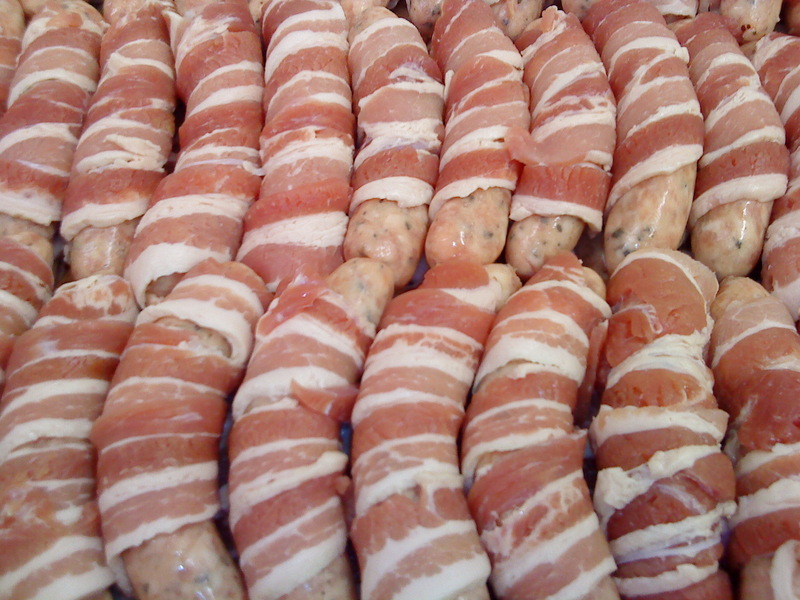 In the UK pigs in blankets are a chipolata sausage wrapped in a piece of bacon and roasted in the oven and typically most people would have them only at Christmas time. The trick to serving great pigs in blankets is to make sure you use the best meat that you can afford, there is nothing worse than pigs in blankets made from the cheapest nastiest frozen sausages wrapped in watery bacon full of preservatives. In recent years I have started using olive oil infused with sage, rosemary and garlic when I cook my pigs in a blanket, all three flavours go great with pork and just really help to lift it to another level. 24 rashers of good quality bacon, I prefer to use maple smoked bacon but it is up to you. The first thing you need to do is infuse your olive oil with the rosemary, sage and garlic flavours, I tend to do this well in advance so that you really get the flavour of the herbs coming through in the oil, ideally 2 weeks to 3 weeks minimum. Bruise the herbs so as to help release their essential oils and drop them into your bottle of olive oil along with the garlic which should be roughly crushed. I tend to remove approximately half of the oil from the bottle before doing this both to allow for displacement and also so as to have oil to hand to help dislodge any stray herbs that get stuck to the neck of the bottle. Refill to the top with oil and place in a cool dark place for as long as possible. when each pig is safely in it’s blanket I like to secure them, you can use a couple of cocktail sticks but I like to be a bit fancy and use a woddy stalk from some rosemary sharpened into a skewer. Lay your pigs in blankets into an oven proof dish and drizzle with the infused oil, if you have any sage leave left over I like to scatter these over before popping the dish into a preheated oven at 185 c for about 35 minutes.